Music education is more important than ever before and I’m not afraid to say so. Why do I sound so dramatic? Because I believe we’re at a place in our humanity that’s calling for more empathy, more compassion and more of us working together toward a better future. You won’t find a simpler and more engaging way to teach these skills than through music education. I’ve seen firsthand the profound impact music education has on students. As a teaching artist for over 15 years in the Chicago Public School system, I have story after story of children whose lives were touched for the better by the music education provided them. A principal in one of the poorest and what is considered more dangerous areas in Chicago, made sure I knew how happy he was to see my students out on their front steps playing their recorders the day my course was completed and the students were able to take their instruments home for keeps. These kids felt so proud of their instruments and their ability to play, that they let their entire neighborhood know! I also want to speak to the impact music education has had on my own children. When I was pregnant with Mo, I was dancing (waddling) around the stage in the American premiere of “Jerry Springer: The Opera.” She will forever have a contingency of actors who refer to her as, “the Jerry Springer baby.” I didn’t perform as much when I was pregnant with Gigi, but I was constantly singing to Mo and I was still teaching classes. They’ve both been surrounded by music since birth. It’s just a part of our every day life. Now that they’re older they’ve chosen to focus on specific instruments. Mo is studying the trumpet and Gigi plays the violin. If you follow Kidlosophy on Instagram, you’ll often find clips of Gigi practicing her violin at 7 o’clock in the morning in our Instagram stories because she loves it. She practices violin whenever she feels like it, which could mean any hour of the day! They’re both in choir at school. They play recorders that happen to be laying around the house. No joke. As well as kazoos. Did you know you can get a bag of them at Party City for $3.84. Seriously. 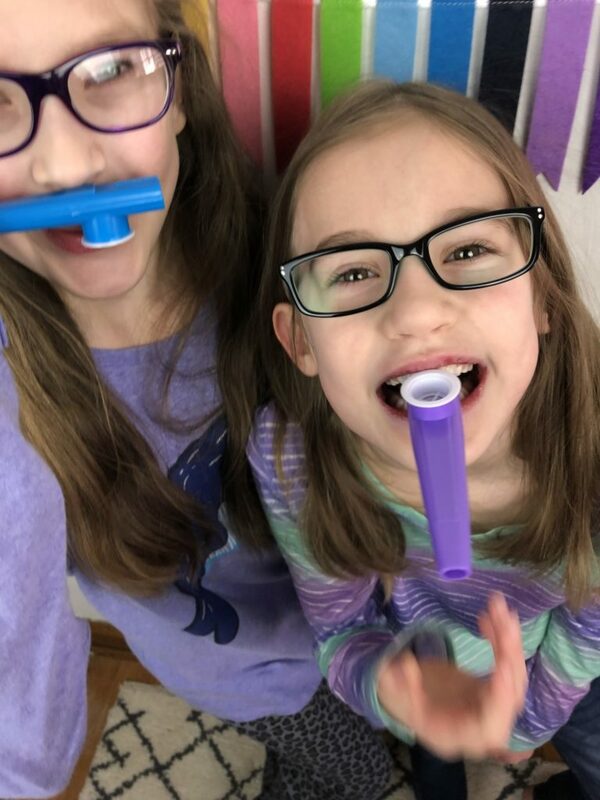 For under $5 your kids can play the kazoo to their favorite songs and have a really fun time. You may need a bit of alone time afterwards, but they’ll have a ball! I wanted to do research of homeschooling families including music education in their curriculum. And that leads me to why I was booted from a Facebook group. As a previous homeschooling mom and a member of this particular group, I used a poll to ask whether or not music education was a part of their homeschooling curriculum. (I prefaced the poll by saying I was a teaching artist and looking for feedback.) I asked if they paid for online materials or strictly sought out free materials. I concluded by asking if their children participated in local community groups such as a chorus, band or orchestra. Pretty innocuous questions, right? My heart sank when I read the results. Of the people who answered the poll, the majority said they did not include music education in their homeschooling curriculum. But the people who did include music education wrote the most heart-warming responses in the comments section. They loved how much their children enjoyed music. They shared their resources for online music education and multiple parents said they were hoping to learn more about music right alongside their child. Unfortunately within 12 hours my poll was deleted and I was booted from the group. Many groups have rules about selling or promoting which I personally believe are necessary. As of the date of the poll, I had nothing to sell or promote related to music education curriculum. I’m not sure if the administrator thought I was being invasive with my questioning? At this point I’ve decided against writing a message to ask her for clarification and here’s why: I love music. I love music education. If you ever think I’m implying it’s an important part of your child’s development, let me make it clear: I 100% percent believe it is. Let me also be clear about this; I won’t judge you for not including music education in your home. But I will always let you know I’m here to help. The songs I write and the music I sing are all about living with kindness, imagination and determination in your heart. Even Chicago Parent Magazine featured Kidlosophy and the kindness we try to live by. One little boot will not stop me from asking questions and trying to help you get started including music education in your family’s daily life. Want tips on implementing more music education in your family’s life? Subscribe to my newsletter here.